Just Christmas and Birthdaycards is having a great sketch made by Mada this week. 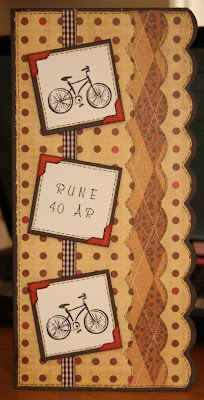 I've made a birthdaycard for a man turning 40, and it's a customer who has ordered the card. 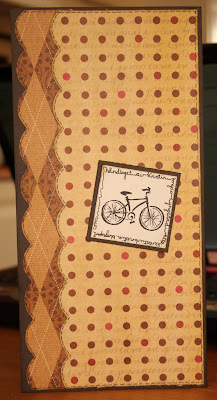 The birthdayman is enjoying riding his bike a lot so that's why I've used my bike stamp again. I've decorated the insides with a balloon stamp to make it really festive. And the calendar stamp makes it easy to put a ring around the month and the actual date. The text stamp says "One year older, but still young in body and soul". 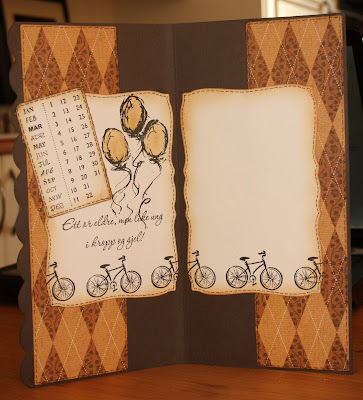 I've put another bike image on the back of the card and I've written my name around the edges. Today we have a beautiful autumn day her where I live. I love this time of year, and the days are so good when I can enjoy the nice weather and the beautiful colours. Det var et litt kult kort Kristin :-), likte de scalloped kantene ved siden av hverandre :-) SMART.